" Céad Mile Fáilte go teach Lolaido "
Irish greeting, meaning one hundred thousand welcomes to Lolaido House. 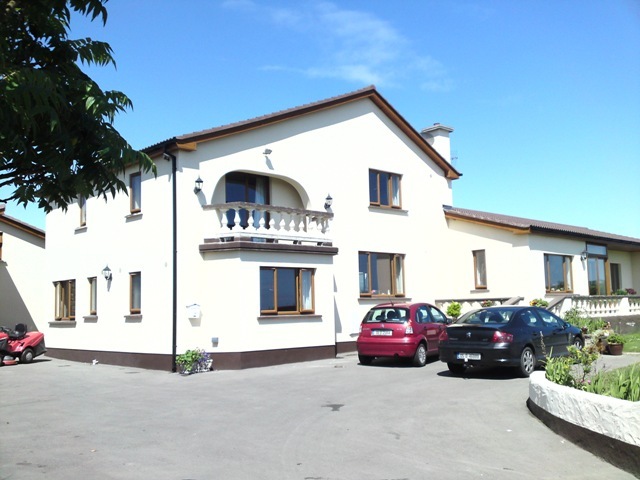 Our family owned B&B is located in a peaceful and serene area of North County Dublin. We are ideally situated 12 miles or 20 minutes from Dublin Airport, 35 minutes from the City, 2 Km ( 1 Mile ) outside the seaside and scenic town of Skerries. The seaside town of Skerries offers many attractions and is the stepping stone for those interested in visiting various sites in the locality. The Skerries skyline is dominated by 2 windmills which have been refurbished. There is a waterwheel and mill centre which is open to the public, and the tourist information centre is located there. Lolaido House is ideal for the perfect golfing break, with a view overlooking the 9th hole and 10th tee box in Skerries Golf Club. There are some of the best golf courses in the country on our door step, e.g. Portmarnock, Baltray and St. Margaret's. There are many public and pay-as-you-play courses within a 12 mile radius that are reasonably priced and are open all year. The first weekend in July offers motorbike racing organised by the Loughshinny Motor Cycle club, who run the Skerries Road Races. Lolaido House is at present, the only Bed and Breakfast actually located on the circuit near the hairpin. On the second weekend in September we have the Killalane Road Races. This circuit runs on part of the Skerries Circuit, from the start line to the Dublin Corner. It can be very eventful both at the practice and the actual races with lots of incidences and some great racing. Why not check us out, we know you will enjoy your stay!